Happy Thursday everyone! It is a gray day here in Nashville, only 43 degrees. Last weekend it was 80 degrees! I heard that New York got a foot of snow, so I guess I shouldn't complain too much (especially since it will be 100 degrees outside soon enough). Today I wanted to share what's caught my eye in the "new" section at Magpie Patterns! Amy does such a wonderful job curating her shop. First up, I am in LOVE with this Grown Up Hoodie. The cables (are those considered cables?) up the back are just too cool. 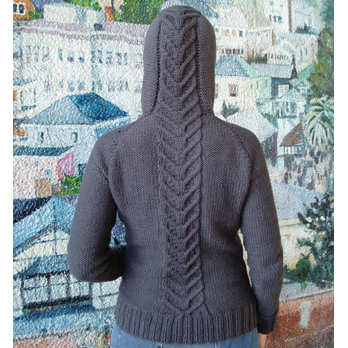 And, if I started knitting now, I might actually finish this in time for Fall! 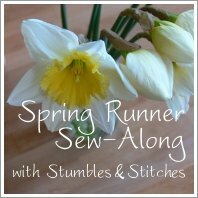 Spring Runner: Details and Fabrics! 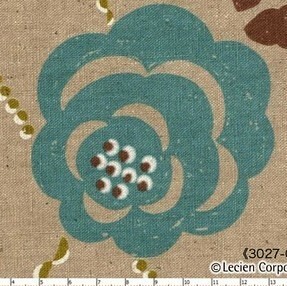 I'm getting so excited about our little Sew-Along project! Dear readers, have you signed up? We've got 16 participants already, not including ourselves and our Runner guru Rashida Coleman-Hale. I am giddy and just cannot wait to see what everyone will create! Before I show you my fabric choices, I wanted to go over a few details for everyone who is participating. Hello there! 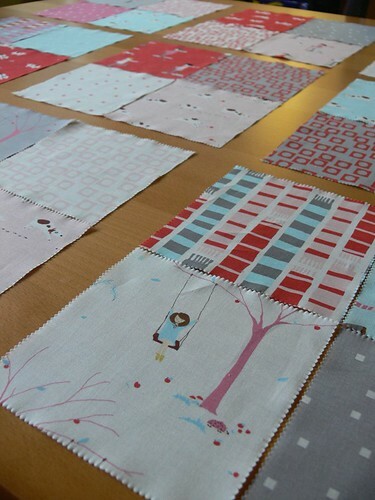 Still under the weather in our casa, but I'm using this indoor time productively: to make progress on my latest baby gift, a quilt using the adorable Sherbet Pips fabric line. I'm calling this one "Charming Baby Quilt" because it's my first time using a Charm Pack, and this fabric is just too, too cute. I've come up with a super simple pattern, which I can share when the quilt is done if you or our dear readers are interested (let me know in the comments, if you don't mind!). So far, I've got the quilt top finished! Here it is. It came together super easy and fast (if you don't count the 3-year-old and 4-month-old doing their best to interrupt my efforts!). 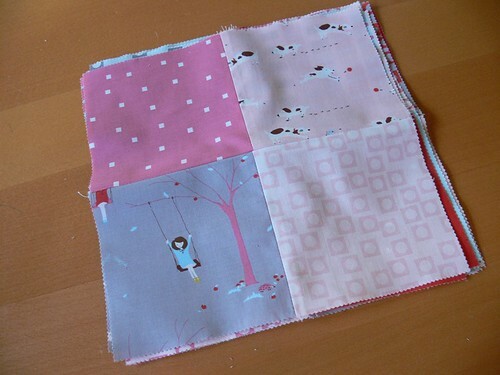 I just sewed 4 charm squares together, 9 times. Jensings, who said: "Ooooooo! Printable story houses." BWardwell who said: "Wildflower seed pods for me - I have tons of flower seeds and this seems like a project that's do-able with my kids. " SunT who said: "mix and match story cards!" Winners, we will send your email addresses to Annie over at Bird and Little Bird, so keep an eye on your inboxes! Thanks to everyone who entered. If you didn't win but would still like a copy of this wonderful magazine, go HERE! We've got LOTS of fun stuff in store for the next few weeks, so be sure not to miss any posts! You can keep in touch with us through Facebook and Twitter, or subscribe to our RSS! Happy Friday from the house of sick. Blah. I am so done with this yucky bug. It's been over two weeks now since it entered this house. After caring for Ben and the hubby while they were knocked down by it, then taking my teeny baby to the ER for high fever (he's okay now), *I* am now coughing every 5 minutes. That is, when I'm not blowing my nose. Just, blah. But, enough complaining. I expect (hope!) to be well again soon enough. And in the meantime, we've got lots going on around here! 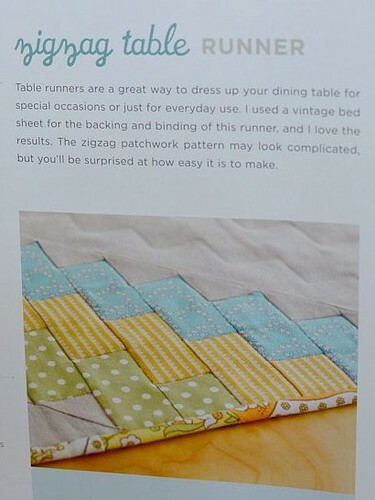 Sew along with us: make a runner for your dining room (or kitchen, or windowsill...), show it off and earn a chance to win some cool stuff! 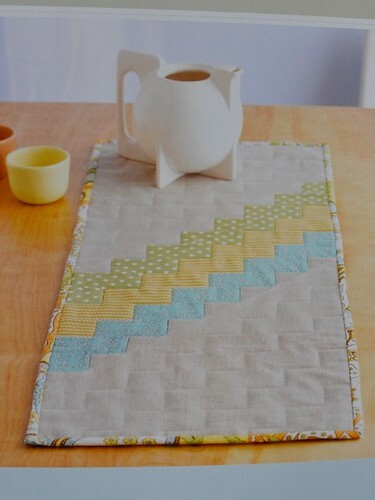 Our inspiration is the lovely Zigzag Table Runner (above) from the equally lovely book I Love Patchwork by Rashida Coleman-Hale. We'd love to engage all of you out there to participate by making a runner for your own space. 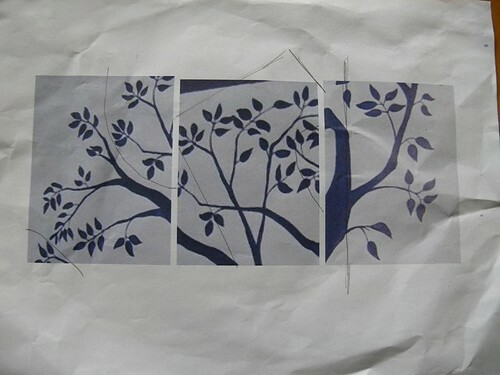 Using these images (or the pattern if you have it) of Rashida's beautiful and light-hearted piece as a jumping-off point, the goal is to usher Spring indoors with a pretty and simple project. 2) Be inspired by Rashida's runner in at least one way: the pattern, the linen, the zigzag, the tricolor theme, the vintage fabric... You decide! - Comment on this post -- this is your commitment to make a runner so we can get a headcount. (We're not going to hunt you down and steal your fabric stash if you don't get yours done, but please only commit if you believe you can make it!) You can sign up anytime until April 12. - Post one photo of your finished runner in our Spring Runner Flickr pool, by April 19. In the photo description, explain your inspiration and/or link to a blog post where you provide details. Please label your photo "Spring Runner Submission". Note: If you do not have a Flickr account, simply email us your photo along with your descriptive blurb to stumblesstitches (at) ymail (dot) com. Same deadline. We'll upload the photo to Flickr and post it in the pool for you. We will be working on our own runners and sharing our progress over the next few weeks. On April 20, we will show you our finished projects and vote to choose a winner from the Flickr pool submissions! Are you ready to play?! Happy Spring! Comments are closed for this post, since we're past the deadline to sign up! Thanks to everyone who put their name in the hat, can't wait to see what you make. I played with Mod Podge again! 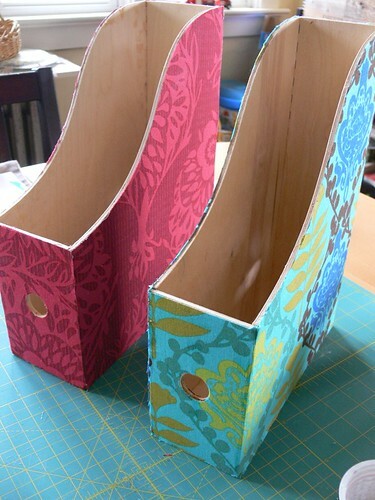 During our last visit to IKEA, I purchased some plywood file holders with the idea of covering them in paper or fabric. 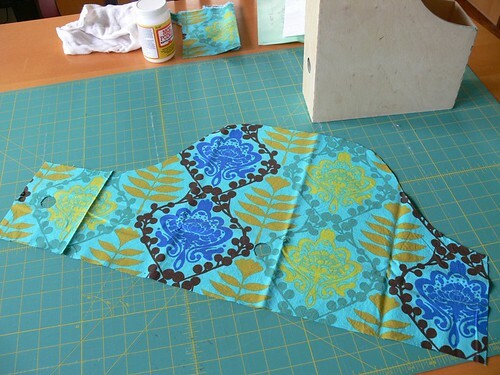 I had scored some awesome Anna Maria Horner fabric during a sale a couple of months ago, and decided the bold prints would be perfect for this project. I think experiment 2) worked better. You don't get all the fabric edges fraying all over the place. 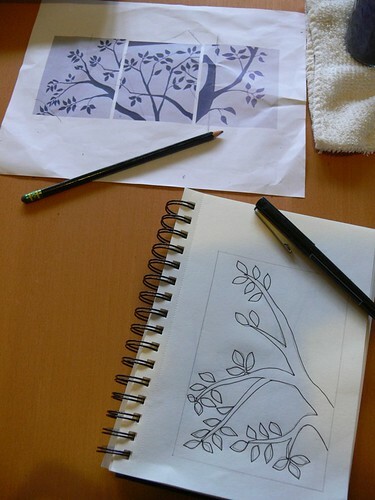 For both versions, I laid the file holder on the flattened fabric and drew the outline of the shape with a fabric marker. 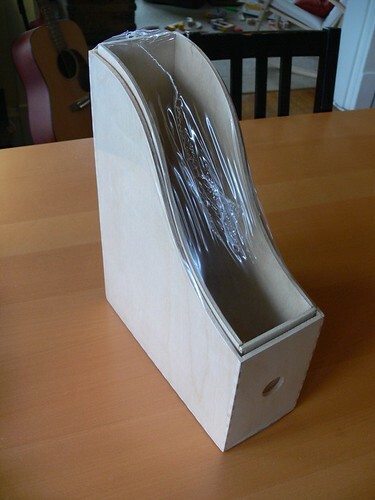 For 2), I flipped the file holder carefully so that I could draw each side next to the other, then just added a little extra flap of fabric to tuck and glue under the other end. 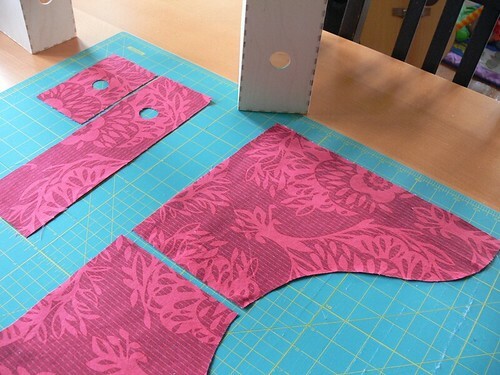 You just have to be extra careful to draw your outline exactly to the size of your file holder with this version, otherwise you will have extra fabric bunching at the edges (which you can kind of see in the photo below). 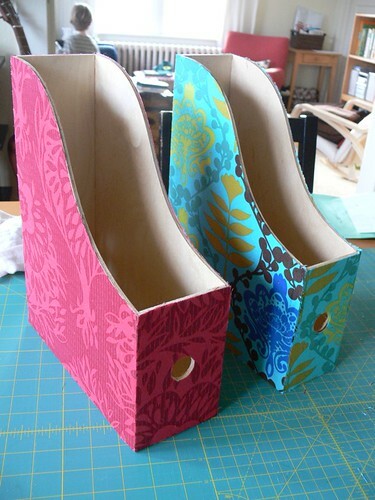 Having learned from my previous Mod Podge + fabric experience, I didn't apply another coat on top of the fabric, so these file holders are nice and smooth. They are already full of papers and files on my desk! 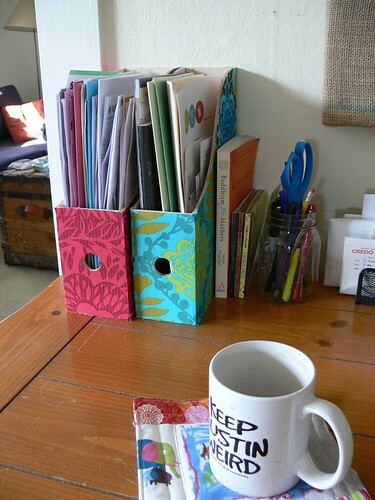 I love how the vertical storage gives my desk so much more usable space (for more clutter, ha!). Jenny you are on a Mod Podge ROLL! Wow. These turned out great! 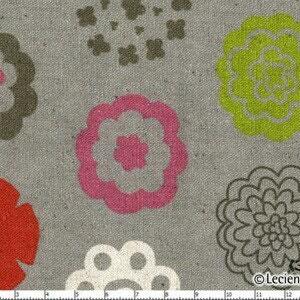 You can't go wrong using AMH fabric on anything, what a great choice. Hope you and the kiddo are feeling better ASAP, can't wait to share our announcement with everyone tomorrow! Anxiously waiting for Bird and Little Bird's new e-magazine! Reading Babble's top 50 Craft Mom blogs for 2011 and feeling happy to see some of my very favorites listed (and dreaming of being on their list some day.....you can vote for us HERE). I'll be back next week to talk about how we celebrated the Spring Equinox, I hope that everyone has a GREAT weekend! My poor baby (the 3-year-old one) has been sick for 5 days now, coughing and just feeling crappy. While this has put a damper on my efforts to get us out the door and doing activities throughout the week, it has allowed us (well, sometimes just me when he's been cuddled under blankets watching TV and the baby's been sleeping) to do lots of crafty stuff. 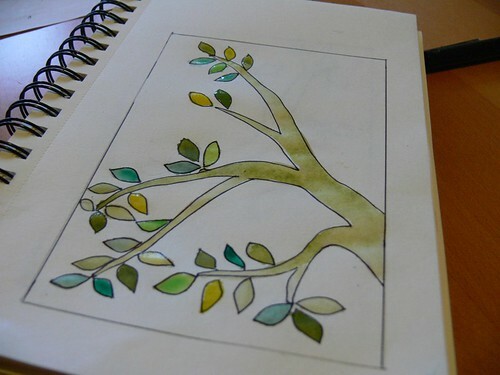 Yesterday, Ben and I sat at the dining room table and got the watercolors out. ... 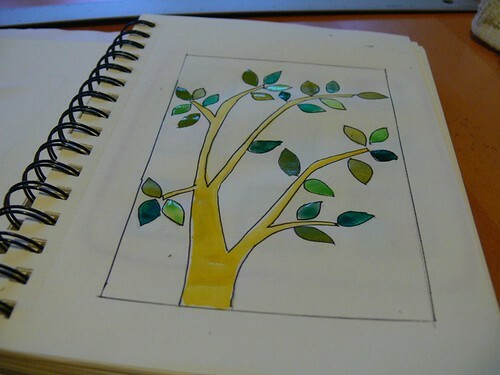 I worked on my sketches for the artwork I am going to make for our friend Kristina. 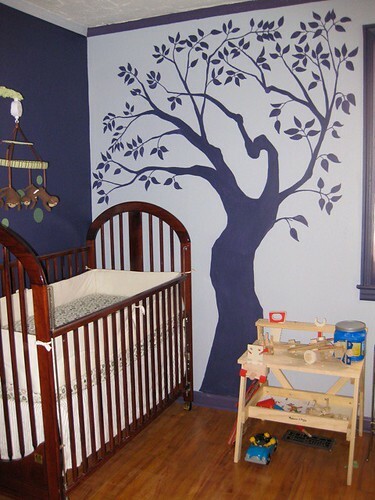 She had a beautiful mural painted in her boys' room a few months ago and would like me to create a triptych of fabric art to complement it. 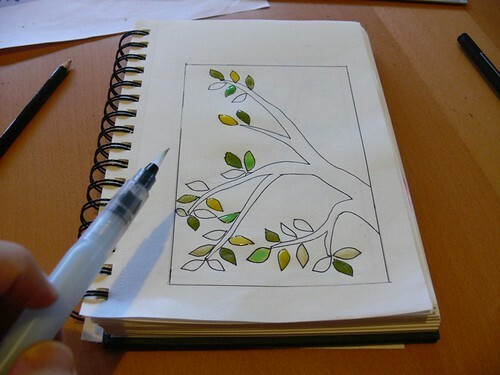 The plan is to use a background of crisp white canvas and create branches and leaves with fabric in a sage color theme. 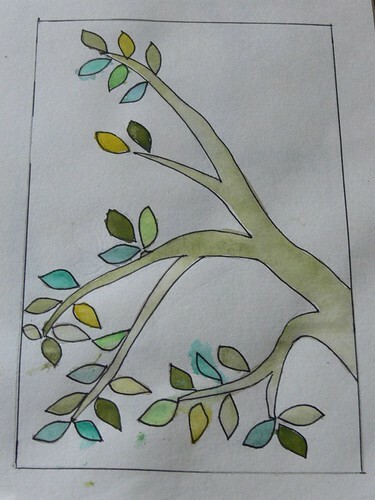 The leaves and branches will be appliqued like in my burlap art. Using my photo editing software, I cropped 3 parts of the mural that I thought would lend themselves well to panels of fabric art. I sketched them in pencil, and when I was happy with that, I traced my drawing in black pen. 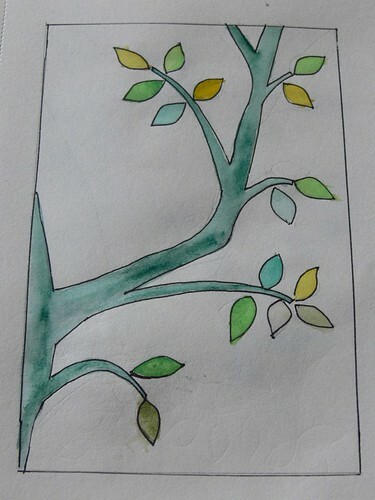 And then I got my watercolors out! 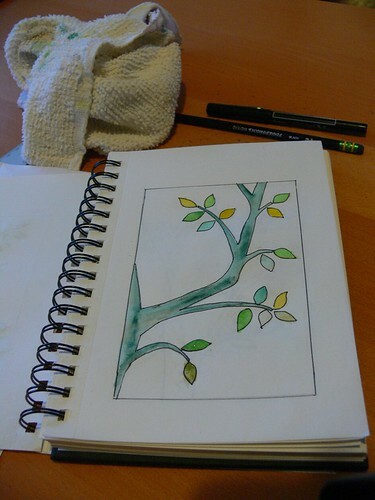 I recently invested in the Koi Watercolor sketching set (based on a recommendation by the awesomely talented Alisa Burke), and it's really changed the way I sketch. I love it! 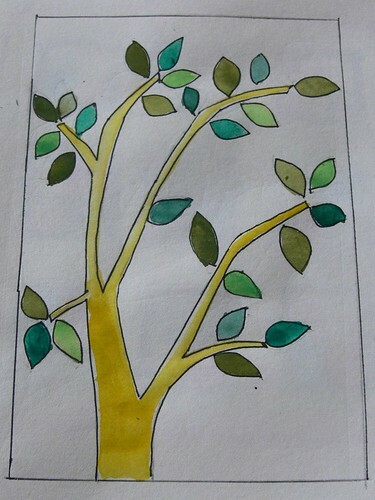 Note: I used the various greens I had available on the watercolor palette instead of making fancy mixes, so the color scheme is not the exact same as the fabric, but it gives you an idea. Here's an approximation of what the final triptych will look like. What do you think? I'd love feedback if you have any. My fabrics are washed and ironed. I bought some double-sided lightweight interfacing (it'll be the first time I use the double-sided stuff, I'm curious and excited -- and hope it'll HELP the process...). If Kristina approves the sketches, I am ready to roll with the actual project. I'll keep you posted! I love your sketches so much, I know I say that every time but it's true! I'm working on an Easter softie and made some sketches of my own, I love learning new things from you! Hope Ben is better soon, Spring is on its way! I keep trying to work on this post and keep getting distracted by thoughts of Japan. I cannot begin to imagine the extent and reality of the devastation after this massive earthquake and tsunami. The pictures are just surreal -- though I'm sure the horror is quite the opposite for all going through it. My words feel trivial, and posting links to pretty things seems a bit pointless and superficial right now. But, as I had already collected several links before today, I'll go ahead and post them in an effort to stay positive. Then I'll go hug my babies. 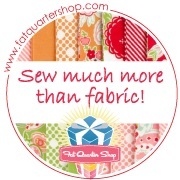 - I love these rounded corners by A Quilt Is Nice, totally doing this on my next quilt. 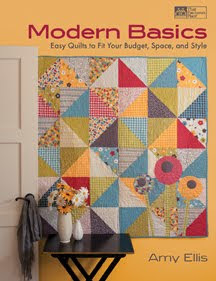 - Can't wait to check this book out: Modern Basics by Amy Ellis. 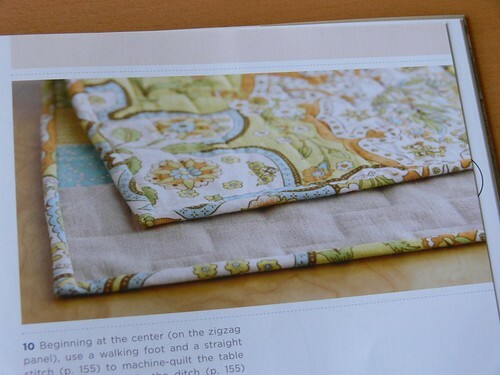 Every quilt photo I've seen on the blog tour has been gorgeous and apparently quite feasible. 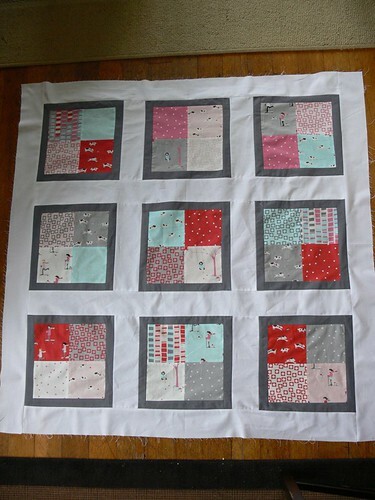 - I saw this Wedding Ring Quilt by Story Quilt on Sew Mama Sew, it is stunning. Update: if you feel as helpless as I do about the situation in Japan, here's a link with all kinds of options for donating and participating to the relief effort. Lee and I were searching the Boxee for something to watch on TV the other night and ran across this awesome series from PBS called Craft in America. To say that it was inspiring would be an understatement, I was in tears at several points during the episode we watched. The episode we watched was Process, and just from getting a glimpse into the creative process of so many unbelievably talented artists touched me in a profound way. Am I the only one that has a fantasy about what an artist actually DOES when they create? That somehow it comes easy, they never get bored, or frustrated, or stuck? This episode did an amazing job of showing the mundane and the magical. I was most impressed by Tom Killion's traditional Japanese wood carving (and that is saying a lot, because all the artists were very talented and interesting). Something he said really struck me, he mentioned that the skill he's had to work on the most, that is most important, is sharpening his woodcutting blades. 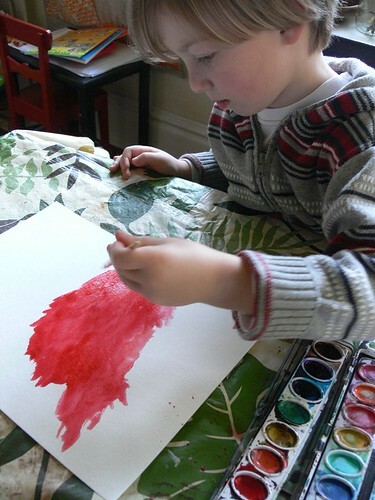 Not imagining what he wants to create, not choosing colors, but sharpening his tools. 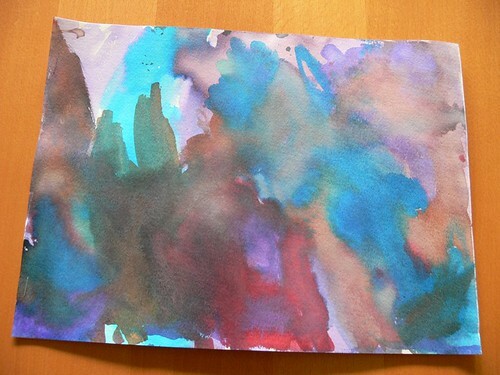 Also, I learned how much trial and error is necessary for him to use multiple colors, how many "ruined" pieces get thrown out as he works with his printing equipment to get things lined up exactly right. What a great lesson in persistence, patience and detachment, don't you think? We only watched one episode, but I can't wait to watch the rest of the series! Here is a 5 minute preview, check it out if you want to be inspired! You can watch the entire series on the PBS website. And here is the main website, with links to all the artists in the series. Angel, I had seen this series described on the PBS website (after you shared it on Facebook, I think) and it looks fantastic. Now that you've described your impressions and emotions over it, I'm even more antsy to see it! I'll have to program our DVR to record it asap. No, this is not a post about sleeping. Though I do dream of the day I'll be able to enjoy a night full of sweet, uninterrupted dreams. Instead... We just got a new couch! Yay! It was about time we replaced that tiny (ahem, disgusting and beat up) loveseat we've had since the days of our first apartment. But I digress. The new sofa is this lovely slate color, kind of blue-grey, and it really changes the color scheme we've had for the last few years with oranges, reds and browns. You know what this means? Time for new deco, including pillows! I'm thinking light and bright, to contrast with the dark upholstery. 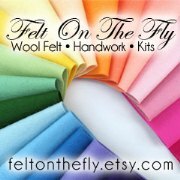 I'd love to include linen or natural fiber tones. The timing for inspiration is perfect as Sew Mama Sew just finished their Pillow Month series a few days ago. 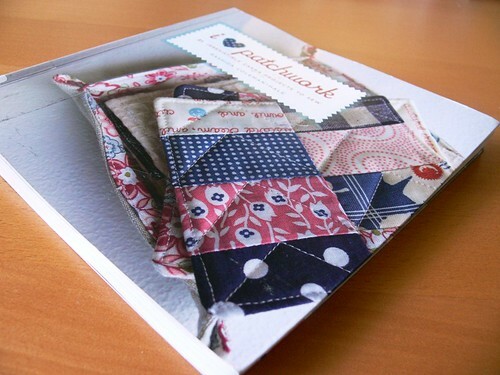 I browsed through their posts and stopped on this one by Olive Handmade. 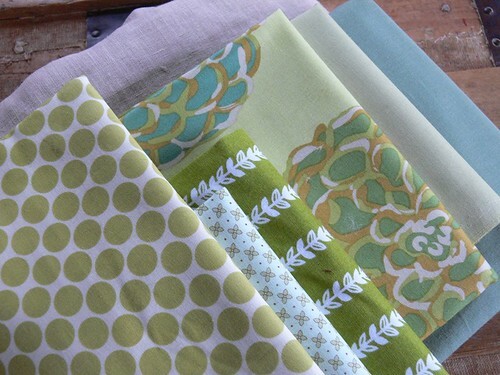 I just love that fabric and the idea of making pillows with a printed linen blend on one side, and a bright solid on the other. Browsing through online fabric shops, I've found two collections that I like: Jenaveve by Valori Wells and Ecco and Heart by Lecien Isso. Here are some of the prints I thought had potential. 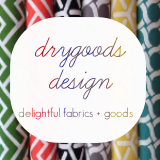 They're all cotton/linen blends and home decor weight. It's a start, but I'm not in love with any of them. 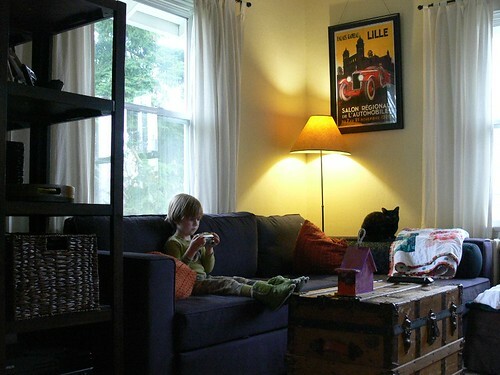 I wish I could find that print used in the Olive Handmade pillow. Does anyone know what that is? 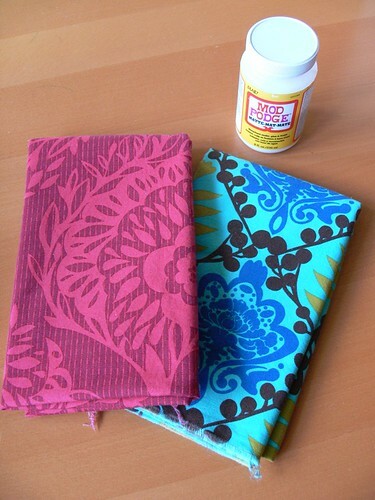 Maybe it's time I go browse the various lovely local fabric shops in Seattle and see if anything strikes my fancy! Let me know if you have any suggestions! Jen, can't wait to SEE YOUR COUCH IN PERSON! Woohoo, tickets purchased!